Fargo 84061 YMCFK Genuine Replacement Ribbon with Manufacturer Warranty. YMC full color panels, K black panel, and F Panel for UV printing. 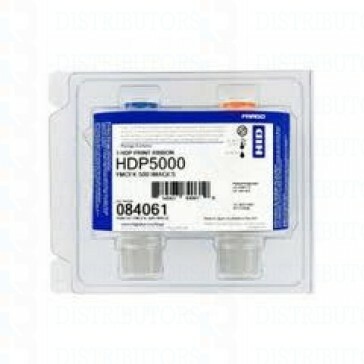 For use with Fargo HDP5000 Series Card Printers. The Fargo 84061 Color Ribbon for the Fargo HDP5000 series printer from ID Distributors is a Genuine Fargo replacement ribbon backed by Fargo's Manufacturer warranty. This 500 print capacity replacement ribbon yields full color printing (YMC Panel), a "K" panel for barcodes and variable data printing, and the "F" panel for UV print images. The Fargo 84061 replacement ribbon's "F" panel offers an additional layer of security. The panel, also known as the "UV" panel", is used to print images and text on the surface of the card only visible with a UV light. This feature is great for organizations that want to increase their card security at a much lower cost than custom holigraphic laminates. The Fargo 84061 is a 5 panel YMCFK ribbon that is capable of printing up to 16.7 million colors with the "Y" Yellow, "M" Magenta, and "C" Cyan, panels. The “K” panel or monochrome is primarily used for variable data like text and barcodes. This replacement monochrome ribbon utilizes RFID technology with the compatible Fargo HDP5000 printer for auto-detection during installation. This auto-detection eliminates the need for any print driver installation. iD Distributors Longevity Tip: Although the Fargo 84061 Color Ribbon includes a cleaning spool to ensure continued print quality and output from your Fargo HDP5000 Card Printer Fargo recommends using the cleaning kit during the new ribbon's installation process to remove dirt and debris and prevent malfunctions such as card jams, print defects causing production downtime and an increase in waste due to card and consumable churn. You can find the compatible cleaning kit for this ribbon and printer by viewing our related products on this page.